Absences…..Diamond Jubilee Collection, Cakes and Tiffinware Day! I’ve finally made it back to my blog after a long absence – work has consumed most, if not all of my time: We’ve been busy shooting hundreds of photos for the new website, which was just launched. The re-vamp includes our ever popular Tiffinware Signature Collection, which is being presently being over-shadowed by the new Diamond Jubilee Collection – surprise surprise! 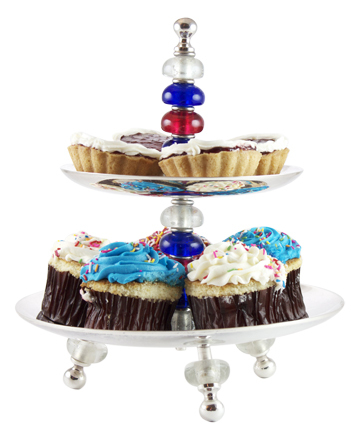 Silver plate Two Tier Cake Stand, embellished with glass beads, perks up every celebration! Two tier Cake Stand in the patriotic red, white and blue especially for the Diamond Jubilee Celebrations. It’s also that time of the year where we plan for our Christmas fairs, stock-taking, annual accounts, etc – the minutiae of life that can never be forgotten or left undone, more’s the pity eh?! We did manage a little holiday in between Christmas and Spring, a few weeks away to re-charge batteries, time to reflect, review, find inspiration, came back refreshed and back to work. I’m about to go walkabout again, to meet the Tiffinware team; we’re having our first ever Tiffinware Day! Be great to catch up with everyone, introduce the new members, review the past year and discuss the exciting new projects in the pipeline (I’m not at liberty to divulge yet! )……..but watch this space! Its been pretty difficult juggling design with price points. I’m sure all you designers out there know what I’m talking about. Raw materials have risen astronomically as have labour rates, inflation, etc etc. We try to keep our costs down so we can share our profits with our customers, cutting out the middle-men. I know you appreciate this and I hope we can continue to share our fair prices with you. In the meantime, enjoy these holidays, eat cakes served off our delicious Cake Stand, make merry at your street parties and toast Her Majesty’s health and her Diamond Jubilee Year.